As discussed in chapter 1, customers in real systems usually require different services provided by different servers. During this process, customers may wait in different queues in front of servers prior to start receiving services. 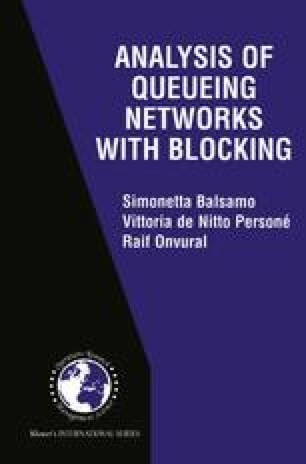 Such complex service systems are often modeled using a network of queueing systems, referred to as a queueing network. The topology of the network represents the flow of customers from one service station to another to meet their service requirements. Hence, a queueing network is a connected directed graph whose nodes represent the service centers. The waiting area in front of a server is represented as a queue. That is, each service station has a queue associated with it. A connection between two servers indicates the one-step moves that customers may make from one service center to another service center. The route that a customer takes through the network may be deterministic or random. Customers may be of different types and may follow different routes through the network.